Today, in virtually every industry, companies recognize that achieving their goals and realizing their vision requires they be quick on their feet. Kice Automation gives you that ability. We have the distinction of automating the largest flour mill in America (16,000CWT single unit– producing 1.6million pounds of flour each day) and we have the privilege of being associated with the largest milling investment in America, 2-10,000cwt mill (producing 2 million pounds of flour each day). The solutions we deploy make our customers more competitive and optimizes their plant operation. Kice Automation is a turnkey systems integrator, providing services which include power distribution, controls engineering design, drafting, UL ®control panel fabrication, PLC/HMI programming, electrical installation, training, start-up support, and 24/7 on-call support. Our experienced team works closely with you to understand your specific automation needs so we can provide the best solution utilizing the latest proven technology. We offer our clients total solutions for their factory automation needs to improve productivity, quality, reliability, and maintenance. The key to the success of a good power system design starts with a thorough understanding of the customer’s needs & design criterion. Kice designs robust power distribution systems, with proper electrical specifications. We provide power one-line diagrams, panelboard schedules, and load flow analysis for all types of projects. Safety – The number one goal is to design a power system which will avoid any electrical hazard. Codes – The National Electric Code (N.E.C.) and local electrical codes provide minimum standards and requirements for safe electrical design, wiring methods, and materials. A good design engineer must be familiar with the code requirements as well as the customer’s facility, process, and operating procedures to design an optimal system. Flexibility and Expandability – In many facilities electrical utilization loads can change. Consideration must be given for future expansion and/or increased load requirements. Maximize Efficiency – Electrical efficiency can generally be maximized by designing systems that minimize the losses in conductors, transformers and utilization equipment. We must keep our customers informed of the pros & cons to create a balanced system. Kice Automation is a leader in process system programming. Our software engineers use straightforward, streamlined programming techniques to optimize plant operation and provide real-time operational data. We develop user friendly HMI interface screens that are simple to use and easy to follow. Our solutions enable companies to synchronize their production data with business systems, which provides real time data for plant decision making. 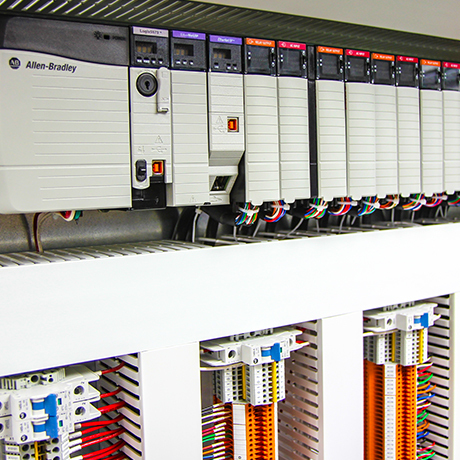 Kice Automation designs and fabricates control panels for a variety of applications from simple motor starters to panels to thousands I/O panels. Kice Automation conforms to nationally recognized codes as set out by the NEC. Kice Automation Panel shop is a UL listed manufacturer for all of North America. With all of the fabrication done in-house, each panel leaves the shop with UL conformity certification and unique identification number. Industrial control panels are built to UL50 standards for a high degree of electrical safety. All components are investigated for UL508A compliance and are suitable for intended use in the application & environment. Panels are designed for ease of installation and future maintenance. To insure minimal on-site troubleshooting during start-ups, all panels are thoroughly inspected and tested before leaving Kice for quality. Kice Automation specializes in Allen Bradley/Rockwell Automation components but also utilizes Telemechanique, Square D, Siemens, ABB and other industrial components you have come to rely on. We have an experienced group of instrumentation engineers to ensure your system is operating efficiently. We have the ability to test, calibrate and repair all types of control devices. Our Automation group offers extensive experience in providing scalable solutions for business intelligence. Whether its trending factors or statistical and efficiency analysis, we can provide the analysis and data in the format you need for the right people in your company. Our scalable solutions are also designed specifically for your mobile application needs so you have quick, easy access to the information on whatever platform you are using. We offer a full range of services to turn large amounts of data into real knowledge you can use to drive results. You need your industrial network infrastructure to be robust, reliable and secure. Our knowledge and experience let us create software and hardware solutions to protect the integrity, availability and security of manufacturing control data. Monitoring the integrity of a grain facility’s equipment is critical. NFPA 61 regulations mandate the need for regular hazard monitoring. We can seamlessly integrate a hazard monitoring system with automation, to provide a user-friendly system that will detect problems before they occur. Working with our sub-contractors, Kice provides total turn-key solutions to meet our customer’s needs. Using our experience, we skillfully evaluate cost efficient techniques to provide functional, aesthetically pleasing, installations while following all applicable NEC or local code requirements. Kice utilizes an integrated project management system that simplifies and streamlines every project, every time. We design systems that meet your production and business goals. We implement the correct & up-to-date architecture to optimize your power & automation assets with predictive, and preventive maintenance methods. We combine elements of your input and our experience for better solution and a build solid foundation for a successful operation. We leverage the latest technologies to help you visualize, analyze, and optimize plant operation. We use the intelligence behind your data to drive quality and protect your brand.